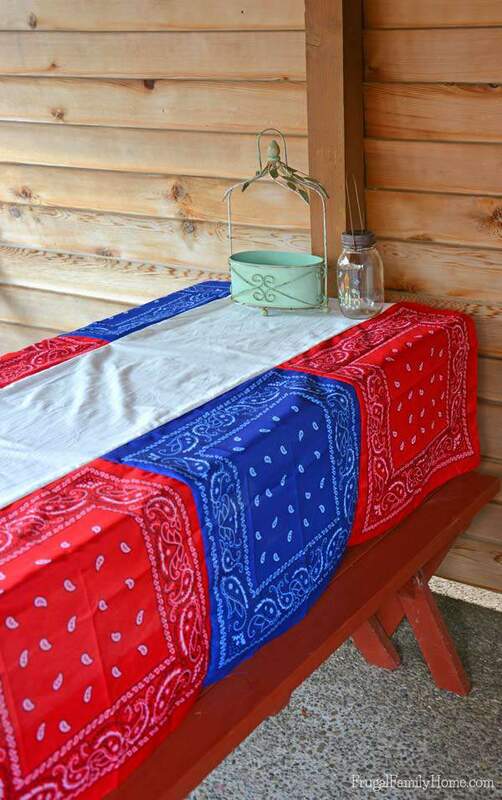 With the 4th of July just a few weeks away I wanted to make a cute tablecloth for the occasion. I wanted to make sure to make it big enough to fit either my picnic table or my dining room table. We never know if it will be warm enough to eat outside on the 4th so it’s better to plan ahead. 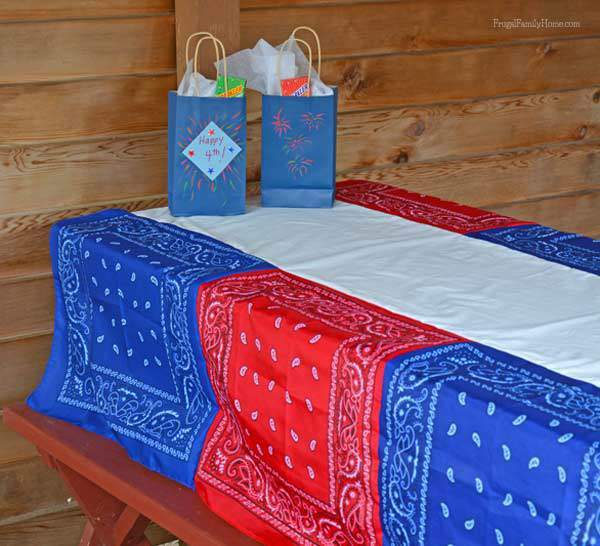 I had seen a few ideas for dish towel tablecloths and bandanna tablecloths. While I was shopping for supplies for our Popsicle Flag craft, I spotted red and blue bandannas at the dollar store. So I snatched up 6 for $3 and settled on a bandanna tablecloth. 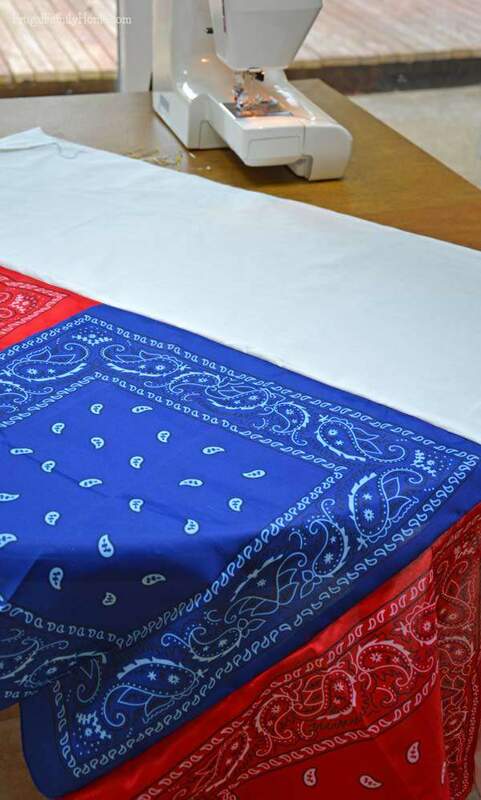 Now after I got home I realized that the bandannas weren’t quite wide enough for my dining room table alone. So I added a white fabric runner in the center to make it wide enough. But not too wide for the picnic table. 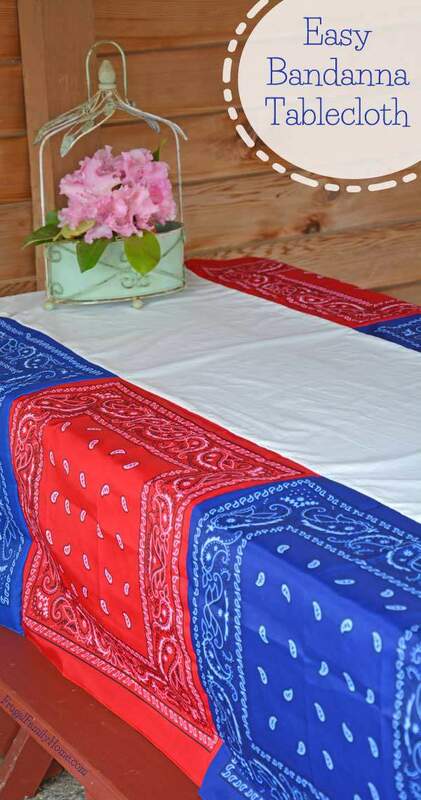 If I were to do this project over I would make the tablecloth with 8 bandannas and a white runner in the middle to make it fit the picnic table length a little better. To start assembling the tablecloth I pinned the bandannas right side together to make a long strip. 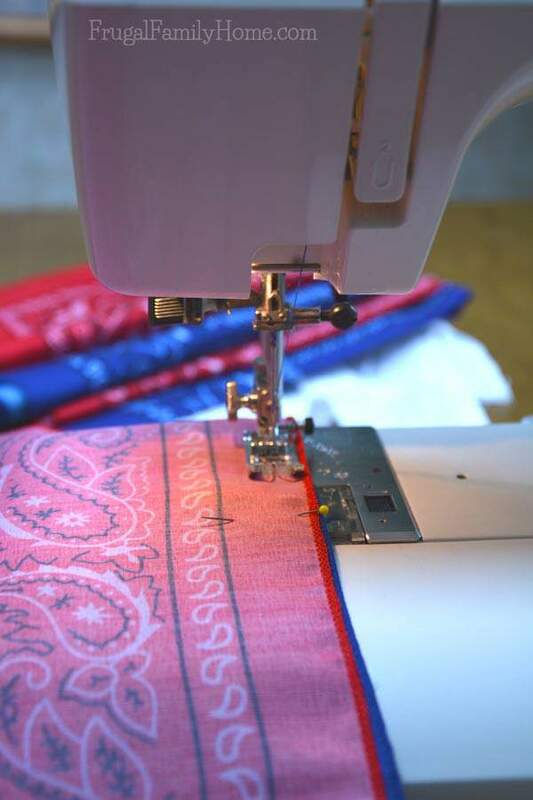 Make sure to double check, I sewed one set of bandannas together wrong and had to take the seam out and sew it again. 🙁 I used three bandannas on each side alternating the colors. But if you have a longer table you might need 4 or 5 per side. Once both bandanna strips were made I cut the white runner strip to the correct length, adding a half an inch to the measurement on each end. So I could hem the raw edges. I hemmed the raw end edges to the right length. My white runner was 15 inches wide, but you can make the width smaller or larger depending on your table size. I now had two bandanna strips and one white runner strip with hemmed end edges. I pinned the bandanna strip to the white runner, with right side facing each other. Then I sewed them together using a 3/8″ seam allowance. Then repeat for the other side. That’s all there is to make this festive tablecloth. 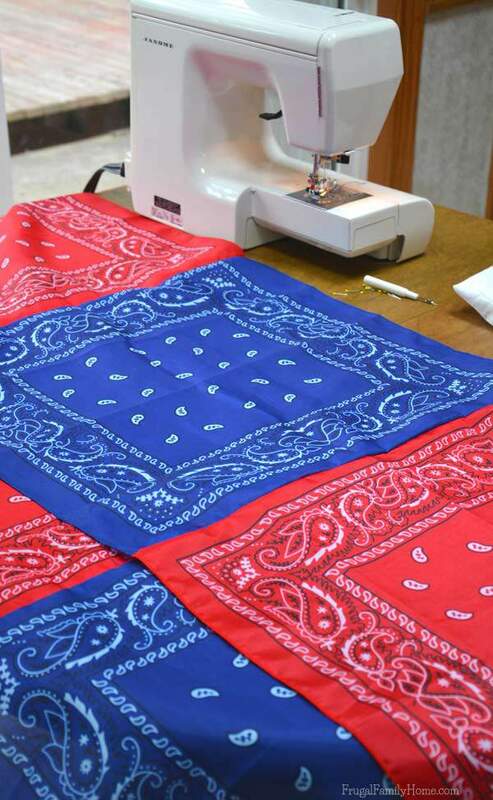 You don’t need to worry about finishing the edges on the bandannas because they are already done. Are you doing any decorating for the 4th of July? That is cute. I bought a sewing machine a while back and this would be a good beginner project for me. I’m getting a picnic table also for our 4th of July party and this would be perfect! Thanks for the cute idea. 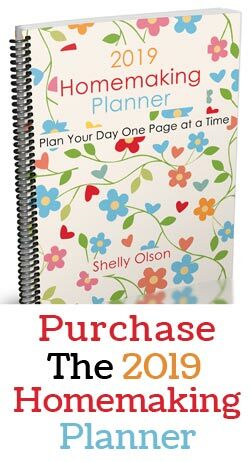 What a neat idea, Shelly! 🙂 Just in time for the 4th of July! 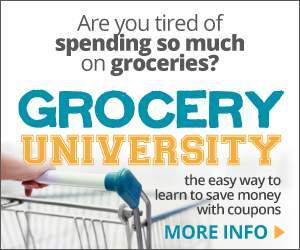 Love this, Shelly! I’m using printables to decorate for the 4th of July. Simple, quick and festive! But if I had a sewing machine, I’d definitely be sewing this tablecloth.